NASA will bid farewell to its history-making Cassini spacecraft, which has been studying Saturn for more than a dozen years and is slated to self-destruct in a “grand finale” on the planet early Friday. 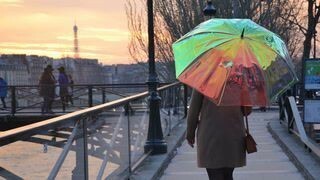 'Oombrella' is a smart umbrella that has sensors on its handle that predicts and alerts you about the incoming weather so that you can grab it before you walk out the door. Take a close-up look at an otherworldly Mars visitor with a Curiosity rover image of a dainty meteorite.